ANDERSON, Calif. -- A Northern California man arriving home from work this week discovered a naked woman he did not know asleep in his bed, police said. The unidentified man told officers the strange saga started Tuesday when he found a parcel ripped open on the porch of his home in the small farming city of Anderson. A utility knife that he had last seen inside in the home was lying on the porch, Anderson police said in a statement. The man went inside and found a sandwich with a bite taken and an open beer. A pack of cigarettes was missing and an empty beer bottle sat nearby. Then he noticed that someone had recently showered in the bathroom and strange clothes strewn about, the statement said. He told police he then found the woman sleeping in his bed. He said he woke her up and called 911. While the man was talking with a police dispatcher, the woman got dressed and wandered out to the front porch and sat down in a chair. Police arrested Michelle Watkins, 33, of Junction City, a small town about 65 miles from where she was arrested. Watkins had the man's pack of cigarettes when she was arrested, the statement said. 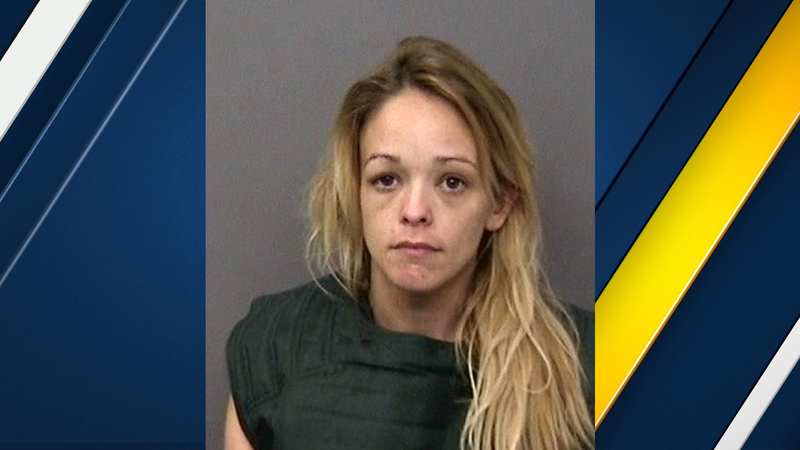 She was jailed for lack of $25,000 bail on suspicion of residential burglary, petty theft and possession of stolen property. Jail records did not indicate if she is represented by an attorney.